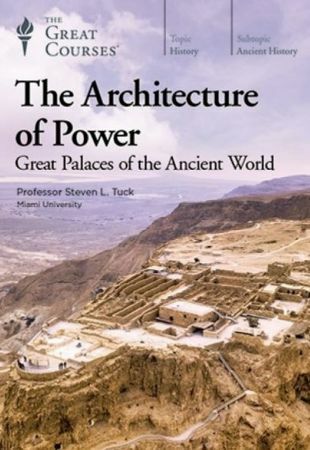 The Architecture of Power: Great Palaces of the Ancient World | Free eBooks Download - EBOOKEE! The palaces of rulers past and present are truly a sight to behold. Marvel at Weiyang, China's Endless Palace, about 11 times the size of Vatican City. Tour the gorgeous gardens at the Palace of Versailles, lined with bronze statues inspired by Dionysus, Apollo, and the four elements. Take a ride on the floating palaces, from the Syracusia of 240 BC, which stood an impressive three decks tall and boasted a library and gymnasium, to Cleopatra's perfumed pleasure ship and Caligula's luxurious bejeweled vessels. The Architecture of Power: Great Palaces of the Ancient World offers an insider's look at some of history's most awe-inspiring structures. In 24 lectures presented by Professor of Classics Steven L. Tuck of Miami University, you will not only get a glimpse into imposing and magnificent sites, but you will also experience many that are inaccessible to the public-and even some that no longer exist. As you make your way through these storied sites, you'll also delve into an exploration of the meaning of power and the ways it operated in societies across the globe. You'll learn how rulers impressed, intimidated, survived, maintained control, and much more. However, they also reflected the rulers' insecurities. Everyone from the Egyptian pharaohs to Saddam Hussein lived under constant threat of assassination and uprisings. Therefore, you'll learn how the palaces offered protection, both internally and externally. Materials: Using rare materials was a clear display of status, from the bronze doors of Persepolis to the numerous fountains and pools lining Saddam's palaces in a land where water is scarce. Imported plants and animals: Perhaps most impressive was the collection of over 40 species of plants as well as domesticated lions and elephants roaming the gardens of the Assyrian palace at Nimrud. This demonstrated the king's power over not only man but also nature. Equally as fascinating as the buildings themselves are the rulers who occupied them. You'll get acquainted with pharaoh Amenhotep IV, who completely redefined Egypt, ushering in a new era and placing himself as an intermediary between his subjects and the sun god. You will hear the captivating stories of Ashurnasirpal II, whose larger-than-life accounts of big-game hunting, immense banquets, and rousing military conquests are enthrallingly depicted in inscriptions throughout the palace at Nimrud. Then there's Caligula, whose flare for spectacle and excess have become hallmarks of decadence and lavish living that continue to be reflected in modern ideas of wealth and celebrity. But with great power comes great responsibility. Professor Tuck shows how public and private personas were deeply intertwined for these rulers. As with today's politicians, the luxurious lifestyles came at a cost, with their primary duty being to serve the people over which they ruled. For instance, Egyptian pharaohs were expected to maintain order in the natural world. Imagine if your life hinged on whether or not the Nile flooded! Hierarchies were reflected in everything, from the dining hall seating and arrangement of rooms, to even the positioning of individuals in decorative sculptures and murals. You'll learn how one relief sculpture lining the staircase leading to the mighty Gate of All Nations in Persepolis was intended to keep visitors in their place, both literally and figuratively. This subservience to rank is also illustrated in the famed terra cotta army from the Qin Dynasty. Palaces are more than just the homes of rulers. Their design and decoration reflect the public images and political needs of their occupants. And on an even deeper level, you'll see how every aesthetic decision is representative of the culture and regime's collective values. Professor Tuck demonstrates how design motifs can carry universal significance, reappearing across continents over time. He also reveals the ways in which design evoked not only power, but also ideals of order and balance. For example, in China's Weiyang Palace, the architectural alignment was intended to create harmony with the surrounding landscape and exemplified the vital balance of Yin and Yang. In fact, the appearance of a palace is so important to its function in society that any alterations or "makeovers" would often signify shifts in culture as well as a change of regime. You will also look at the way the world and our conception of power via architecture has not changed as much as you might think; palaces are not just relics of a bygone era. Although today's major structures may not resemble the palaces of ancient Rome and Egypt on the surface, if you look closer you'll see many iconographic similarities, even in the most mundane and unexpected places. Such similarities can be found in department story layouts, modern political structures like the White House and Houses of Parliament, and even Amazon headquarters in Seattle. This course is brought to life with over 700 images including graphics, maps, floor plans, reconstructions, artwork, portraits, artifacts, and interior and exterior photos. You will even see reconstructions and floor plans from palaces that are notoriously inaccessible to the public-and some that no longer exist beyond what history has recorded of them. Professor Tuck's engaging and deeply knowledgeable presentation is supported by his own archaeological experience in Europe and Egypt, as well as tours he has led in Italy and Greece. Even for familiar topics such as the Renaissance, he digs deep beneath the surface, revealing unexpected insights and new perspectives. Throughout the lectures, Professor Tuck doesn't just present history as a collection of facts and figures, but rather reinforces how everything has contributed to the big picture. While he does delve into the intricacies of design, he's equally invested in their profound implications for society. After taking this course, you'll see these places and what they mean-in the past, as well as today-in a whole new way. No comments for "The Architecture of Power: Great Palaces of the Ancient World".